Welcome here dear reader! The English language is replete with several words which that look alike though sometimes not related. However, some of these words share a level of similarities. 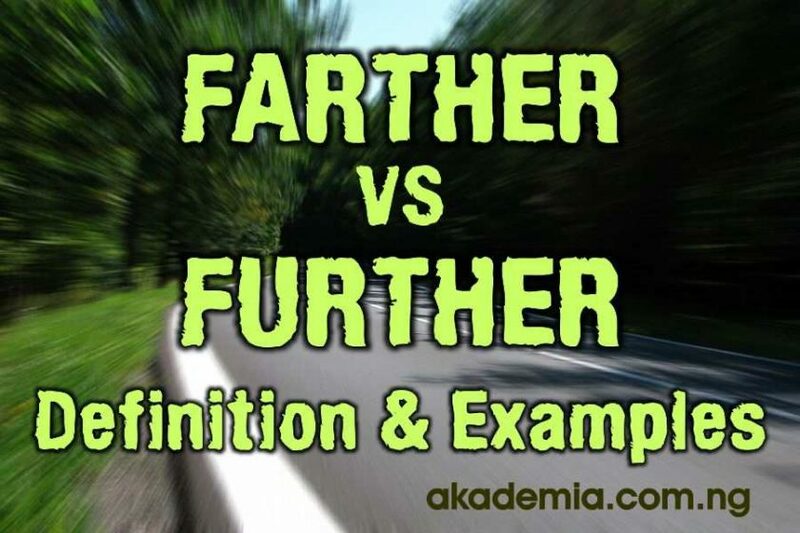 This post, How to Use Farther and Further with Examples, examines the correct usage of this pair. Farther, as an adverb, means ‘to a greater distance; that is ‘to or at a point that is more distant in space or time or a more advanced point’. It also means ‘to a greater degree or extent’. As an adjective, it means ‘more distant’; that is ‘more distant in space or time’. It also means ‘additional’; that is, ‘adding to the quantity or extent of something’. She does not have to at any farther in the matter. They apart at the farther edge of the clearing. The man stepped away to be farther away from the culprit. He fell farther than he expected. The nearest petrol station was much farther than he thought. The released shark swam farther into the sea. The horseman rode farther and farther into the woods. As we retired, they advanced farther. The school will close until further notice. The publisher asked if the author had anything to add to the volume. We need to look further into the future. There is a need to further break down the cost analysis. Let’s not pursue the matter any further. He spoke further that the organisation would employ more staff. We shall require further supplies. The judge requested further information on the case. Late submission of forms will attract further charges. Her father had nothing further to add. It took a further two shots of anaesthesia to knock him off. It is farther to Lagos from here than it is to Abuja. Seattle is farther than New York. It is further to the sea than I thought. He went further down the road. They drove further into the city in search of fuel. Further time is required to complete the task. The police have ordered further investigation. The teacher will shed further light on the subject. The action will further the cause of freedom. He could not further his studies due to paucity of funds. We raised money to further the cause of the less privileged in the society. We can further enhance her skill. However, we cannot use farther in same context. A reversal seems to be happening in the use of further and farther as adjectives. Farther is taking on the meaning of distance as we have in the farther shore; while further is taking on the meaning of addition as in the guest speaker needed no further introduction. These two words behave similarly. As an adverb, it refers to: ‘the greatest degree or extent than anything else’, ‘to or at the greatest distance in time or space than anything else; farthest’. As an adjective, it refers to the ‘most distant or remote in time or space, farthest. It has the same meaning as furthest above; both as an adjective and as an adverb. This is a related adjective to farther which means ‘most distant or remote’.